Holman’s Funeral Service exclusively offers Cremation with Confidence™, which increases your faith in the choice of cremation. 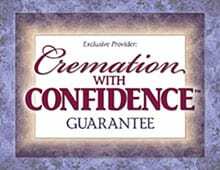 Learn here about the Ten-Step Process of Cremation with Confidence™. The result is peace of mind. At Holman’s Funeral and Cremation Service, we have a strict code of ethics and procedures we adhere to while your loved one is in our care. And, we have a preferred crematory that we know and trust to uphold those ethical standards. To ensure continued quality, we conduct periodic surprise inspections of the crematory. As part of our procedures, one of our staff members will accompany your loved one to the crematory, and will bring the cremated remains back to the funeral home. We do this to ensure that your loved one is well cared for at all times, and to guarantee that the cremated remains you receive are those of your loved one. To ensure security, a personal identification band is placed on your loved one at the moment they one is transferred to our care. Personal belongings are catalogued and placed in a secure area for their return to the family. Upon arrival, your loved one is logged into our tracking system and assigned an identification number. This number is used to track every phase of the cremation process. Our tracking system includes date and time of arrival at our facility and name of the funeral director. At your request, our staff will bathe and dress your loved one in the clothes provided by the family or a gown we provide. Then, we will ask you, or a family representative, to positively identify him or her prior to cremation. Two individuals – a cremation technician and a funeral home staff member – will review all cremation paperwork and permits. This is to ensure authorizations and permits have been received and have been properly documented. The cremation process will not begin until all documentation is verified. Immediately prior to the cremation process, your loved one is taken to the crematory by the funeral director. Upon arrival, their personal identification is noted in the cremation log. This log shows the name of the individual, date and time of the cremation, identification number and crematory operator’s name. The crematory log is dated and the start time is noted and initialed by a cremation technician before and after the cremation. 7.) Details during the cremation. The crematory checklist and identification disc are placed on the outside of the cremation chamber during the cremation process. 8.) Details after the cremation. After the cremation is complete, the cremated remains are placed into a temporary container that is suitable for transportation. 9.) Return of the cremated remains. Our staff will notify you to schedule a time for receipt of the cremated remains. At the funeral home, we can provide a dignified setting in which to receive the cremated remains, where you may spend a few moments, privately, in quiet reflection. Or, we can hand deliver the cremated remains to your home. We will assist in planning a funeral or memorial service, either before or after the cremation, to celebrate the life of your loved one. A meaningful ceremony provides an opportunity for family and friends to pay tribute to your loved one and to share the memories of a lifetime.